There’s been a lot of discussion in the SEO community about hordes of zombie visitors. Unfortunately a lot of the old-timer SEOs have gotten bored and frustrated with the forums so they aren’t chiming in very much. The forums are the same thing over and over; “All my traffic is gone, I’m innocent of everything, I hate Google, I will not listen to advice, I know it all, I will only argue and tell you you’re wrong, There is no solution.” The forums just don’t foster the depth of discussion and collaborative thought that they used to. I’m going to discuss zombie traffic here and shed some light on what you can do about it. For the sake of this discussion, zombies are people who arrived at a website and have terrible engagement and conversion stats. Basically, they are people who don’t really want to be on your website but arrived from Google’s search results because RankBrain thought your site was relevant to their query and intent. 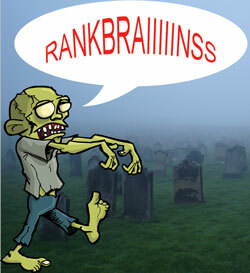 Zombies are people who confuse RankBrain, often because the searchers themselves are confused. They aren’t good at describing the product or service they seek, they might not be native speakers of your target language so their syntax and vernacular could be way off, or they’re people who have received a good set of results but your site ranks among Amazon and Walmart and all they did was come to your site to price-check. That’s not QUITE zombie traffic, but I think in the ecommerce world it’s a part of it. RankBrain is (as far as I know) the first very large scale deployment of machine learning. Yep, Artificial Intelligence. Well… as close as we dare unleash right now. RankBrain is an aspect of Google’s algorithm that is supposed to work out the relevance of a website to a searcher’s query and their intent. RankBrain is constantly “teaching” itself about these relationships based on user interaction with the SERPs and the sites themselves. Here’s the kicker: the only way RankBrain can actually learn is to make comparisons and send potentially bad traffic on PURPOSE. That’s right; RankBrain sends zombies on PURPOSE. RankBrain is NOT the algorithm’s core, it’s a way of adding refinement by interpretation of the results returned by the core (the core: Hummingbird, Panda, Penguin, EMD, Payday, etc. ), and trying to deliver better results. RankBrain will continue to get better as time goes by, the number of zombie visits it sends will decrease (never to zero), and the quality of traffic you receive will be better than it ever could be without RankBrain. What can you do about zombie traffic? The answer is something the SEO forums would hate; optimize your site. The complainers on the forums say they’re optimizing and have been for years and that zombie traffic keeps increasing. In all honesty, those people probably aren’t very good at SEO. They are chasing their tails because every time they change something, it’s probably on a whim and they are undoing what RankBrain has learned about their site and making RankBrain send MORE zombie traffic to try to learn what the webmaster is doing. And around and around they go. So, don’t listen to those folks. There is hope. Here’s what you need to know. If your site is getting a lot of zombie traffic it’s probably because your messaging is very unclear or very bad. It’s highly likely that RankBrain is using your site as an example of a site that a user does NOT want to visit. Think about that… depressing, isn’t it? Your site is so bad it’s basically a control group. I think this is the single most ignored fact about RankBrain. The webmasters that get the most zombie traffic are always the ones that say “it’s not me it’s Google”. If you’ve said that, then it’s time to pull your head out of the sand, swallow your pride, and ask for help. No SEO has all the answers. We must learn, adapt, ask for help, and keep our pride in check. If you can’t do that, you might need to explore other career options. Work on your content to make it 100% unique and expert in your niche. You MUST speak the native language of your target audience, and speak it as well as a native. Google is really good at discerning what content was written by a non-native speaker. Understand your user’s intent. Why do they come to your site? What do you want them to do when they get there? How would your user describe your product or service in a search query? Make your content, navigation, links, image alt tags… EVERYTHING reflect what you know about your user to make it 100% clear to RankBrain what kind of user it should send to your site. Create schema markup for everything you can. Don’t rely on Google to extract information from your content. Spoon feed it to them to make it clear. Make your site as technically sound as possible. Properly optimize your title AND description tags on all pages. Build strong links that are highly relevant to your topic. I can’t stress this enough. Don’t make random changes in knee-jerk reactions. Make a plan and follow it. You may feel some pain as RankBrain learns, but stick with it and be patient. Give it time to learn, and depending on how popular your niche is, it could take quite a while to learn. Ten to 25 visitors a day from organic is NOT a meaningful sample size for RankBrain to learn how users interact with your site. Always be testing. Design your tests when you’re making your optimization plan. If you don’t have clear measurements for success before you optimize, then you’ll have no idea if what you’re doing is working. Gently refine when you find what works. Don’t be afraid of the zombie apocalypse. You can stem the tide with good optimization and clear content. RankBrain is pretty awesome but it’s still an infant. If RankBrain is confused about your site, you need to spoon feed it until it gets it right.